A couple of hours ago, my friend Lluis Torras posted on Facebook in celebration of the 21st anniversary of his marriage to Laura Villanueva Calduch. I naturally wanted to congratulate them and normally should have done so in the Catalan language that he had used. But there was only one word, an English word, that seemed right as a comment on what he’d said. And that was “beautiful.” As I typed that, though, I remembered one reason why the word is so evocative in English. 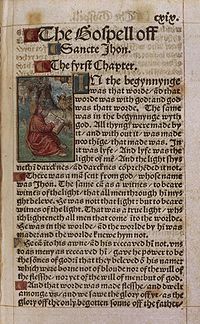 The word fair had been the normal adjective for the concept of beauty in English until Tyndale’s translation of the Bible into English (1525). It seemed that “fair” simply didn’t suffice for some of the images that he was reading in Hebrew and Greek, so he used (maybe for the first time in literature) the word beautiful. Tyndale was executed for his pains, but we can be grateful for having such a fair word as beautiful in our language.